Man Utd 4 Feyenoord 0: Rooney and Mkhitaryan made statements as United remained in control during Thursday's game. 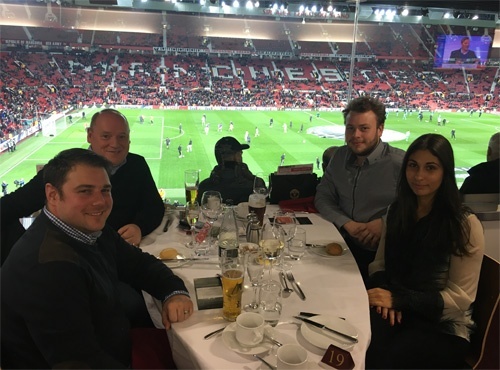 With Crystal Ball securing a corporate membership at Manchester United's Executive Club for the 16/17 season, this provided a unique spectator experience for our highly valued customers at the Manchester Utd v Feyenoord Europa League game on Thursday evening. With champagne and canapes on arrival followed by a 4 course a la carte menu and unlimited beverages, Crystal Ball's Marketing Manager; Tara Singh invited customer's Andrew Pass (Penine Acute Trust NHS), Martin Murphy (Hero Renewables Ltd) and Dan Manford (Nyke Energy Services Ltd) to sit back and enjoy the game. A fantastic evening was had by all with great food and company, drinks flowing and a satisfying 4-0 win for Manchester Utd. We look forward to inviting and treating more customers at Man Utd with the next home game being Manchester Utd vs West-Ham, November 27th.